Tipping off in a few days’ time, the 2015 edition of the PBA Governors’ Cup will introduce a couple of innovations towards making the season-ending conference a more interesting tournament. Aside from the incentive of tapping a reinforcement with unlimited height for the four lowest-quotient teams after two conferences as compared to the remaining eight squads which are restricted to an import with a maximum ceiling of 6’5”, all 12 teams are given the option of enlisting another import, specifically of Asian descent and with a height limit of 6’3”, to beef up their respective rosters. The four squads which have been granted the privilege to acquire skyscrapers are the KIA Carnival, Blackwater Elite, Barako Bull Energy and the GlobalPort Batang Pier. So far, three teams, including defending conference champs Purefoods, have brought back familiar faces. With regards to Asian imports, only seven of the 12 squads have opted bring someone in. SLAM PH takes a look at the imports gracing the hardwood in the 2015 PBA Governors Cup, as we start with the reinforcements being paraded by KIA, Blackwater, Barako Bull, NLEX, Meralco and Barangay Ginebra. It was almost certain that the KIA Carnival would retain the services of their Commissioners’ Cup import Peter John Ramos to fortify its side once more as the hulking Puerto Rican was literally the biggest reason why KIA pocketed a franchise-record four victories in the midseason conference, after starting the season with just a lone win. However, issues with his playing contract in Puerto Rico, where he is currently seeing action for Brujos de Guayama, have prevented Ramos from returning to the PBA Governors’ Cup. Taking his place instead is Senegalese pivot Hamady N’Diaye, who is no stranger to the Philippine brand of basketball, as he was part of his country’s FIBA World Championship squad, which engaged Gilas Pilipinas in an overtime thriller last year. Just like Ramos, the 7’0” N’Diaye also played in the NBA, suiting up for the Washington Wizards from 2010-12 and the Sacramento Kings in the 2013-14 season. 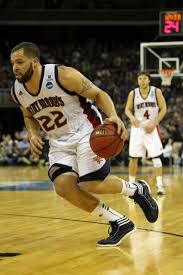 In the 33 games he actually played in, Ndiaye averaged 0.6 points, 0.8 rebounds, 0.3 blocks and 0.1 assists. Before latching on with Kia, N’Diaye suited up for Lebanese squad Byblos this 2014-15 season, with the slotman garnering per-game averages of 7 points and 7.9 rebounds. He was also part of several D-League rosters, including the Dakota Wizards, Iowa Energy, Maine Red Claws, Reno Big Horns and Delaware 87ers. He also played for the Chinese side Tianjin RongGang. Prior to the team’s 2014 FIBA World Cup appearance, N’Diaye was a member of the bronze-winning Senegal national team in the FIBA Africa Championship back in 2013. Because of his immense contribution to his team’s performance in the last conference, the Blackwater Elite opted to recall Marcus Douthit for another tour of duty after the small feat they achieved in the Commissioner’s Cup. 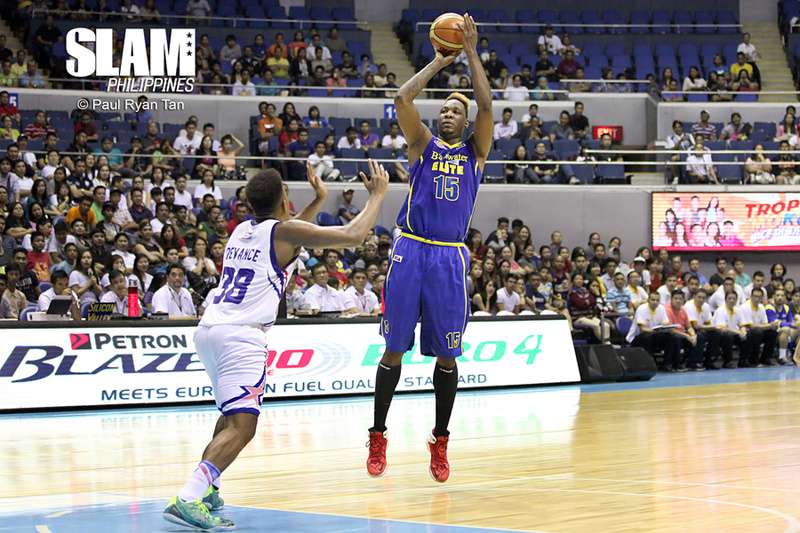 With Douthit considered as one of the team’s driving forces, the Elite registered a three-win slate, following their winless maiden conference in the PBA. Efficient on both the offensive and defensive ends as he averaged 22 points, 14 rebounds and 3.8 assists to go along with 3.1 blocks and 1.2 steals in 10 games, the naturalized Pinoy served as the team’s catalyst up front for the Elite, and will continue to do so with team gearing up for its campaign in the Governors’ Cup. As one of the more grizzled veterans in this batch of imports, Douthit is expected to utilize his experience, as well as his towering frame to the hilt against smaller counterparts, whether it be a local or a foreign cager. Barako Bull was also impressed with their Commissioner’s Cup import, Solomon Alabi, and like Kia and Blackwater, were hoping to bring their man back for a second tour of duty.However, because of a family issue, the former Toronto Raptor is back in the States, which prompted the Energy to enlist Liam McMorrow as Alabi’s replacement. A towering presence in the paint just like Alabi, the 7’2″ McMorrow hails from Toronto, Canada and played for Tennessee Technological University in the US NCAA Division 1. 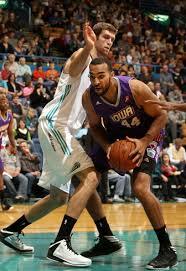 After college, the Canadian slotman played for the Halifax Rainmen squad in his motherland’s National Basketball League. In the 2014-15 season, McMorrow appeared in 25 outings and averaged 11.9 points and 7.3 rebounds a ballgame. He also had stops in the NBA D-League, where he played in four games for the Iowa Energy in the 2012-13 season, as well as in the 2013-14 NBA Summer League, where he suited up for the New York Knicks. He may not have the height compared to the three towers previously mentioned, but just the same, burly Rob Jones loves mixing it in the paint regardless of the disparity in size. Listed at 6’6” but expected to make the height limit in the PBA, Jones makes up for his lack of height through his heft, using it to bully his way to the shaded lane. Using his 240-lb frame to his advantage, Jones banged his way to decent averages of 14.4 markers and 9.3 boards for St. Mary’s College from 2010-12. Prior to his stint with the Gaels, Jones spent his first two years of college ball with the University of San Diego Toreros. Before joining the Road Warriors, Jones recently balled in the Puerto Rican league, where he posted averages of 9.0 points, 6.3 rebounds. 1.5 assists and 1.3 steals per for the Brujos de Guayama squad. With Jones in its fold, NLEX is equipped with another presence to supplement its frontcourt led by the ageless Asi Taulava. Last conference, Josh Davis did well in his inaugural run in the PBA as he towed the Bolts to a semifinal finish. This time in the Governors Cup, the Bolts are looking to do better in duplicating or even improving their standing in the previous conference with another first-time PBA import in their roster. A sweet-shooting swingman out of Dallas, Andre Emmett had the opportunity to be mentored by the legendary Bobby Knight when he suited up for the latter’s Texas Tech Red Raiders in college. This partnership would prove to be fruitful, with Emmett currently holding the title of being Texas Tech’s all-time leading scorer with 2,256 points. Selected in the second round of the 2004 NBA Draft by the Seattle Supersonics, Emmett had played in the League for two seasons. The first was in 2004-05 with the Memphis Grizzlies, and the second one in 2011-12, when he played six games for the then-New Jersey Nets, averaging 2.2 points, 1.0 rebounds, while shooting 57 percent from the field. Playing as well in the D-League, Emmett saw action for the Austin Toros, Los Angeles D-Fenders, Reno Big Horns and the Fort Wayne Mad Ants. 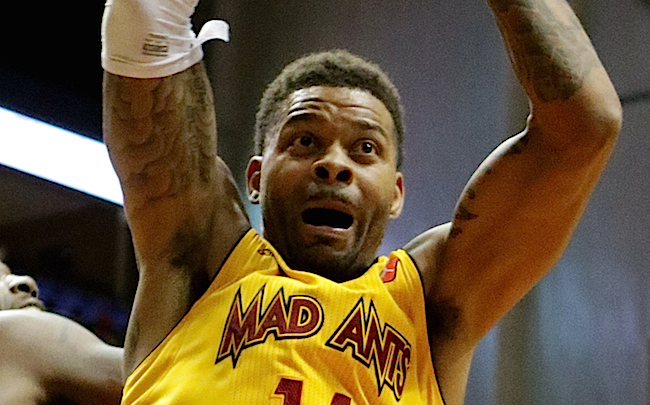 Suiting up for the Mad Ants in the 2014-15 season, Emmett was selected to the 2015 D-League All-Star Game for the second time in his career and was named All-Star MVP after posting 28 points, four rebounds and the same number of steals in the annual showcase. Emmett also made the rounds around the world throughout his pro career. Aside from his present assignment in the Philippines, he has also played in countries such as Belgium, China, France, Lebanon, Lithuania, Mexico, Puerto Rico and Venezuela. The Gin Kings will be leaning on two new faces to spearhead their campaign in the season-ending conference. One is Frankie Lim, who will be making his debut as a PBA head coach after a successful career at the collegiate ranks. The other one will be the team’s reinforcement Orlando Johnson, who just like his bench boss, will also have his baptism of fire in the local pro league. 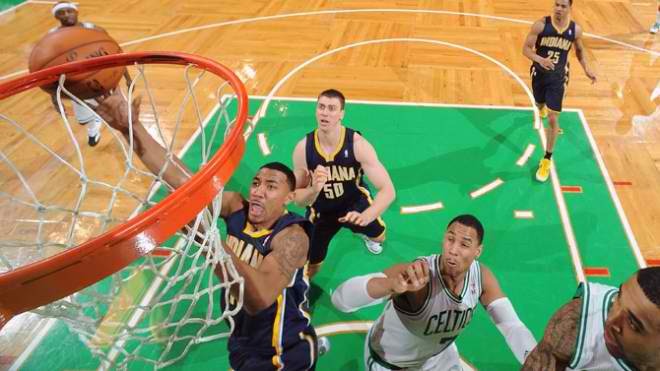 This will not be the first time that Johnson played in the country though, as he was part of the Indiana Pacers squad that participated in the Philippine leg of the 2013 NBA Global Games held in October of that year. 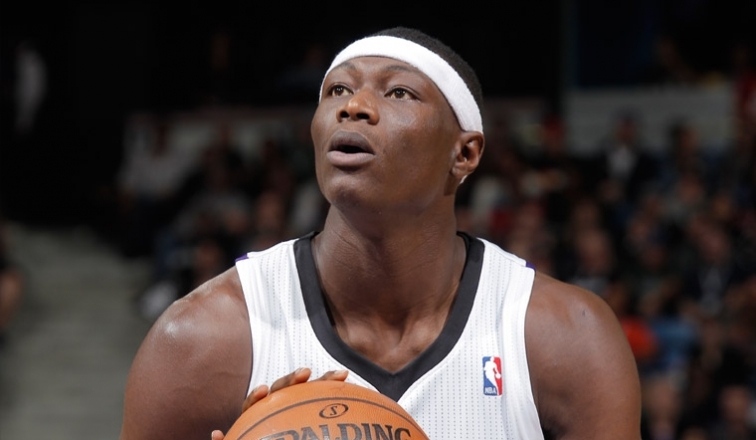 Aside from the Pacers, the former Big West Player of the Year in the US NCAA also strutted his stuff for the Sacramento Kings in the latter part of the 2013-14 season. With 96 career NBA games tucked under his belt, Johnson registered per-game statistics of 3.2 points, 1.7 boards and 0.7 assists during his tenure with the Pacers and the Kings. In addition to donning the colors of Spanish club Laboral Kutxa a year ago, Johnson also spent some time in the D-League with the Fort Wayne Mad Ants and the Austin Toros. In 43 contests for the Toros in the 2014-15 season, Johnson averaged 17.4 points, 5.2 rebounds, 3.2 assists and 1.0 steals while shooting 49.6 percent from the field. Given his ability to score buckets at a precise rate from the floor, the 6’5” shooting guard will serve as an additional weapon on the perimeter to supplement Gin King gunners Mark Caguioa and LA Tenorio, as well as the interior tandem of Japeth Aguilar and Greg Slaughter.